You need to improve the quality of your sleep when camping? Well then, there is a better way to do this than to do away with uncomfortable camping beds, such as self-inflating mats. The best way is to switch to camp folding beds or camping cots. Actually the best camping cot can be the finest choice for a site area or outdoor holidays without necessarily bringing along all your beddings. Such product will provide you with a good night sleep and will ensure that you wake up without a stiff back or neck. They will also help you elevate your shut-eye experience while out in the wild. For the best camping pillows, to help you with sleep, see our article on this useful site. 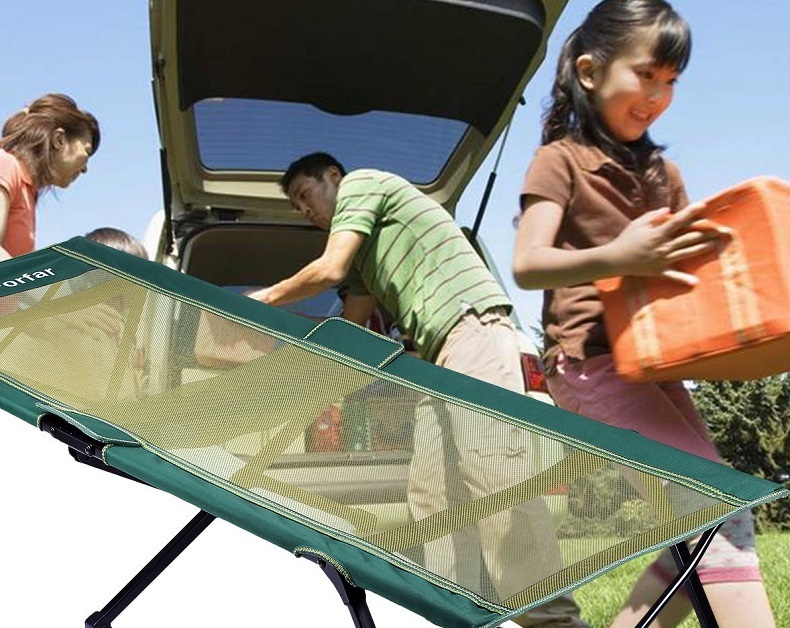 A good cot for camping should be easy to carry along. It should be designed from high quality materials and the overlaying fabric needs to be strong and comfortable. You have to choose a model that can fold easily in order to make it easier for you to store and carry. Avoid beds that cannot fold conveniently and are not made of polyester, nylon or rust-resistant metal. The best model to buy should be lightweight enough for you to carry around. Normally, the most comfortable models are heavier because of the material used to make them. They usually have more metal frames as well as extra padding. However, you should keep in mind that your ease of movement around the camping site depends on how easy you can carry your cot. You also need to choose the correct holding capacity depending on who is going to use it: an adult, a teenager, or someone younger. 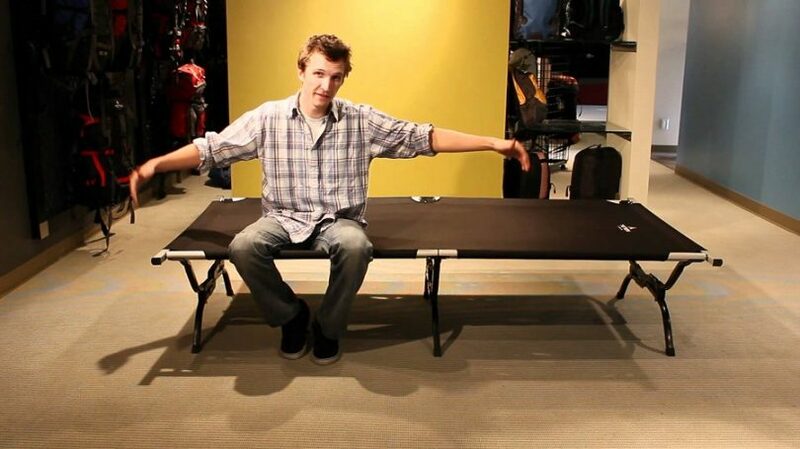 The average adult folding bed dimensions are about 75 inches long and 25 inches wide when fully assembled. If you get the weight and size right, then portability will not be a problem. In addition, the easiness at which a cot disassembles determines how portable it can be. In most cases, the most portable units are the ones that collapse completely when taken to bits. As mentioned earlier, try as much as possible to go for lightweight models. Such are particularly good design for a backpacker. Most people will argue that a lightweight cot sits too low to the ground and it is not durable enough. 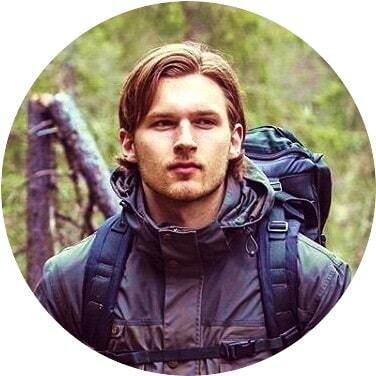 However, when preparing for outdoor activities, weight is a major factor with respect to what you bring along. You have to choose a bed that you can effortlessly pack and not something that will present significant challenges. The simplest design should be forthright, meaning that it should unfold along joints with no trouble and fit into place. Setting up a small bed that fold up for storage or transport requires minimal skills. In fact, if you are good in setting camping tents, then you should have no problem at all with these simple camp beds. 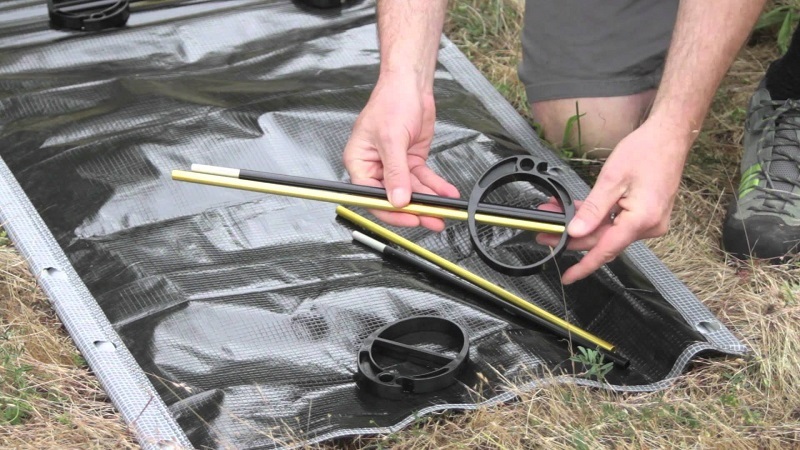 The most groundbreaking designs will need simple and straightforward assembly. You will spend the least time possible doing this. These are good choices for car campers and anyone who wants to experience the comforts of his or her bedroom while out in the woods. 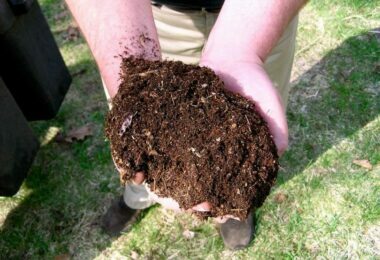 Normally, these divans are sturdier, heavier and they characteristically have extra padding. You will most definitely admire the additional comfort while sleeping. 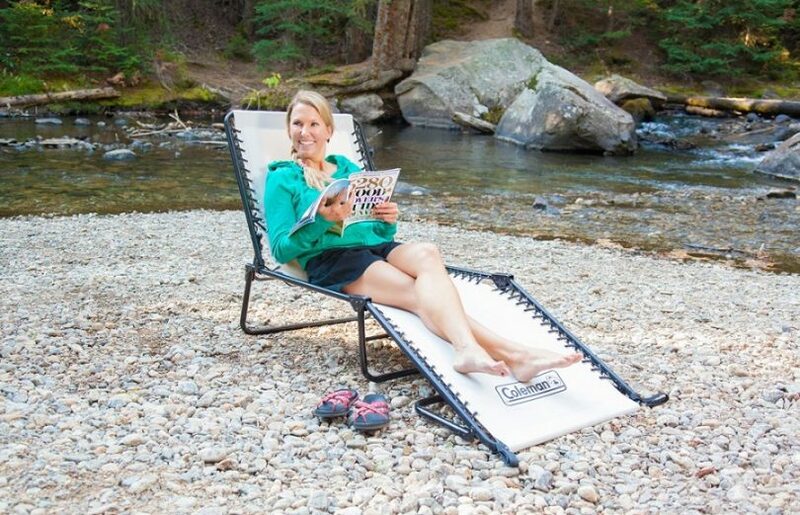 In fact, you can use your luxurious camp cot to lounge in the proximity of your camp fire. Something that weighs more than 12 pounds is certainly heavy for a backpacker. Therefore, you should choose heavy, luxurious camp cots if and only if you are a car camper or if you have a better way of carrying the divans. Otherwise, go for a more convenient option, which should range between 2 and 12 pounds in weight. Measuring 42x12x7 inches and weighing 26 pounds, Outfitter XXL is one of the best divans for car campers. It has state-of-the-art design, and it is oversized and rugged. Unlike most small beds that fold up for storage or transport, this has a weight capacity of 600 pounds along with a patented steel leg construction. The sleeping area is not only bigger (measuring eighty five inches by forty inches when open), but also firmer and can support six hundred pounds without sagging or bowing. You site floor will not be damaged by legs of this unique folding bed, because they are made of rubber and they are completely redefined. Assembling the bed is a few minutes activity since there are very few steps involved in the set up. The frame is usually lumped together, all you need to do is get it out of the bag, then unfold it and get the two end rails in place. It unbelievably collapses into a robust drawstring bag for stowing or carrying and there is a carrying bag too. 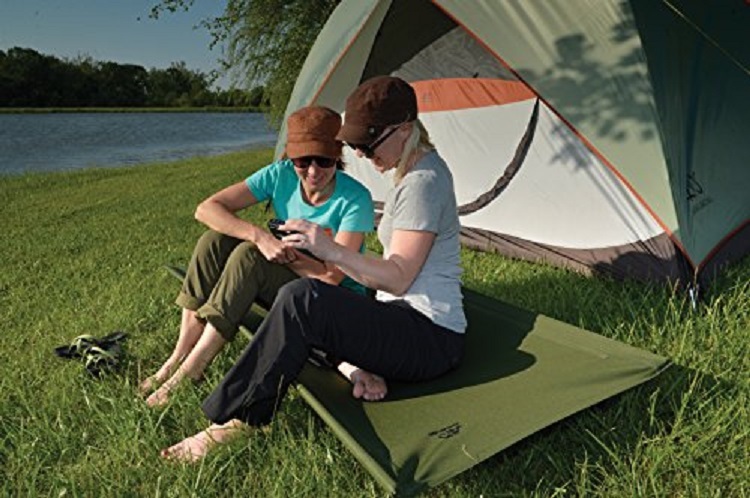 You can improve your camping sleep by adding a custom XXL foam pad, which you will secure separately. If you need something durable, spacious and strong; then the Outfitter XXL should be your first choice. For the best sleeping pads, see our article reviews on this for more options. Pros: It is has a large sleeping area that can support up to 600 pounds and the Outfitter XXL camp pad provides a luxury bed feeling. Cons: The lack of a locking mechanism can make the rails unhook easily. Measuring 2.7×6.8×27.9 inches and weighing 8 pounds, Kamp Rite is one of the finest cots for backpackers. Apart from being lightweight with up-to-the-minute design, it is completely packable. This cradle allows you to have comfortable nights, far away from your normal bed. It has an exceptional frame structure that does not only provide support, but tension as well. Setting up this sleeping unit is easy; it will take you only a few minutes to get the whole thing configured. It conveniently opens up to 72 inches long and 24 inches wide, providing you with more than enough sleeping area for a good night sleep while out in the woods. You do not need to be highly skillful to be able to assemble this cot, all you need are a few assembling skills and it will take you as less as 6 minutes to get the whole thing configured. You should start the assembling process by slipping the poles into the correct pouches and then proceed systematically to avoid any problems. Pros: It is lightweight as well as compact, making it the best choice for disaster preparedness and assembling it is easy. Cons: It can only support people with medium weight. 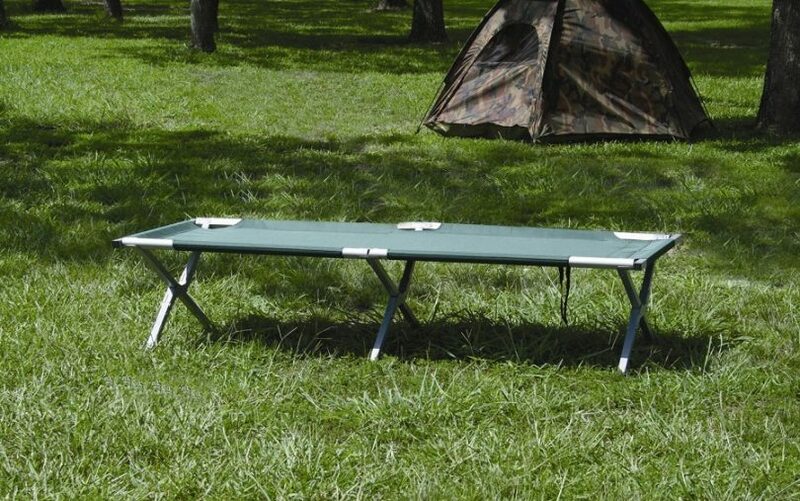 Measuring 75x26x16 inches and weighing 14 pounds, Texsport Deluxe is one of the best folding beds for anyone who wants to be comfortable while sleeping in a camp tent. It is fitted with a glazed 600D polyester concealment and it is completely water resistant. This makes it the best divan to bring along under any weather conditions. It has aluminum frame fitted with steel legs for sturdy support while sleeping. The aluminum frame and steel legs make this a firm cot that can support up to two hundred and fifty pounds. You most definitely want to buy a folding bed that has an easy set up and collapse effortlessly. Texsport Deluxe provides you with just that, all you need are a few minutes to get it fully assembled. If you are used to the comforts of a hammock, then this is the best cot for you because it provides you with similar comforts. You can restfully sleep on your back and you will wake up just fine. It is quite a length bed, which can accommodate a tall person without any problems. The Deluxe comes with a long-lasting storage bag along with informational panel and shoulder strap. Pros: It is spacious, water resistant, made of high quality materials, sturdier and has a compact fold-up process. Cons: It is not a convenient choice for someone who likes sleeping on his/her side or stomach. Measuring 37.6 by 8 by 4.3 inches and weighing 12 pounds, COT-V01 is one of the best folding beds for backpackers/ camping. Unlike most models that exist in the market, this specific masterpiece can be used for a variety of outdoor activities. This is a really tremendous divan, it is as relaxing to use as any well-designed bed. It is equipped with rubber tipped metal legs and sturdy aluminum for portability and comfort. It is made of 600D polyester, which makes it highly water resistant and a good choice for any weather condition. With a holding capacity of two hundred and fifty pounds, COT-V01 will accommodate you without sagging. This bed provides you with adequate elevation from the ground. Therefore, helping you circumvent contact with insects, uneven surface and wet/damp ground. You will be surprised by the sturdiness of this sleeping unit, given the fact that it packs up very compact. It is ready for set up the moment you take it out of the bag. Therefore, it should not be challenging at all as far as set up is concerned. In actual fact, it should take you approximately three minutes to complete the set up and one minute if you have a helping hand. Pros: It is lightweight, made of quality materials, sturdier and convenient for camping along with other outdoor activities. Cons: The fabric is not as thick as advertised. Measuring 9.6x4x37.8 inches and weighing 20.1 pounds, Coleman Trailhead II is the best choice for a holidaymaker. This is a basic, simple, affordable military style divan with a fairly large sleeping area. When you settle for this particular bed, you will be settling for the following: rugged military style, Realtree Xtra camo, side pockets, extra wide design, and strong folding steel frame. Coleman Trailhead II ensures that you are adequately raised from the ground, thus keeping you safe from biting insects and damp/ uneven ground surface. 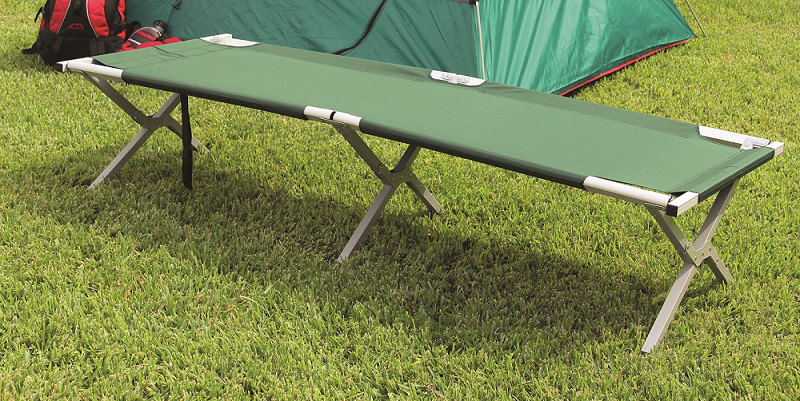 With the steel X-frame, you will always have a sturdier and comfortable place to sleep whenever you camp out. 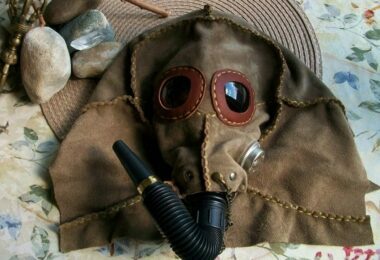 When you are in the woods, you need to be fully prepared. This bed is fitted with multiple side pockets that provide you with more than enough space to store important gear. Its extra-wide design allows you to relax after an adventurous day in the woods. The whole thing is ready for set up whenever you get it off the bag. It is also quite easy to disassemble, since it collapses conveniently. Regardless of what most people will say about this sleeping unit, you need to know that it has all the qualities of a portable bed. Pros: It has state-of-the-art, extra wide design and it is made of high quality materials. Cons: Initial set up of the bed may be challenging. 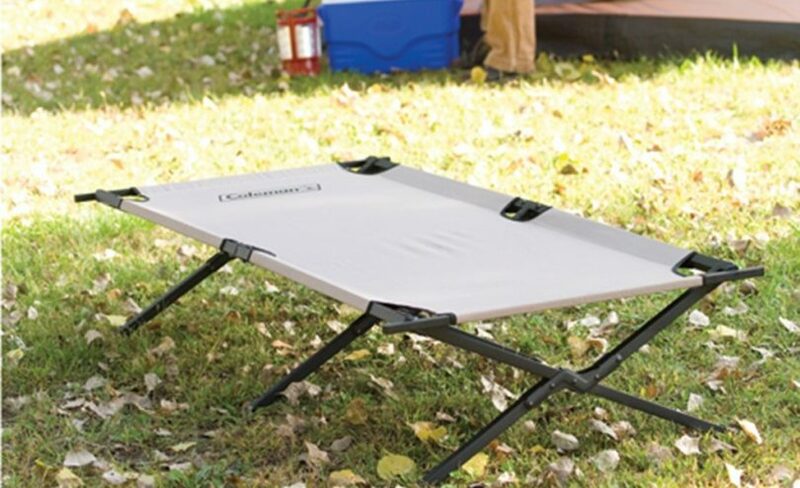 Measuring 76.3×12.8×25.2 inches and weighing 14.1, Coleman Converta suspension is one of the best camping cots with an elevated back section. A feature unique to this camp cot is its flexible bungee suspension system. The suspension system provides you with incredible support while relaxing or sleeping. In fact, you can take advantage of the suspension system to position yourself in a comfortable reading position if you are fond novels as you relax. You can conveniently customize your reclining position by adjusting the four back and two foot positions. People who hit the 6 ft. height should not be worried because this sleeping unit can accommodate people who are as tall as 6 ft. 2 in. You will only damage the whole thing if your weight exceeds two hundred and twenty five pounds, otherwise you should relax and enjoy your sleep. It is made of high quality materials, including rust-resistant steel frame and durable polyester fabric. The sleeping area does not sink in; instead it provides you with sturdy support, which ensures that your back is not suffocated in any way. The cot does rarely shake whenever you lie or sit on it due to the stiff and firm legs. Pros: the flexible bungee suspension system provides you with adequate support and comfort for your back. Cons: If you are not paying attention, adjusting the suspended section back to the cot position can be unsafe. 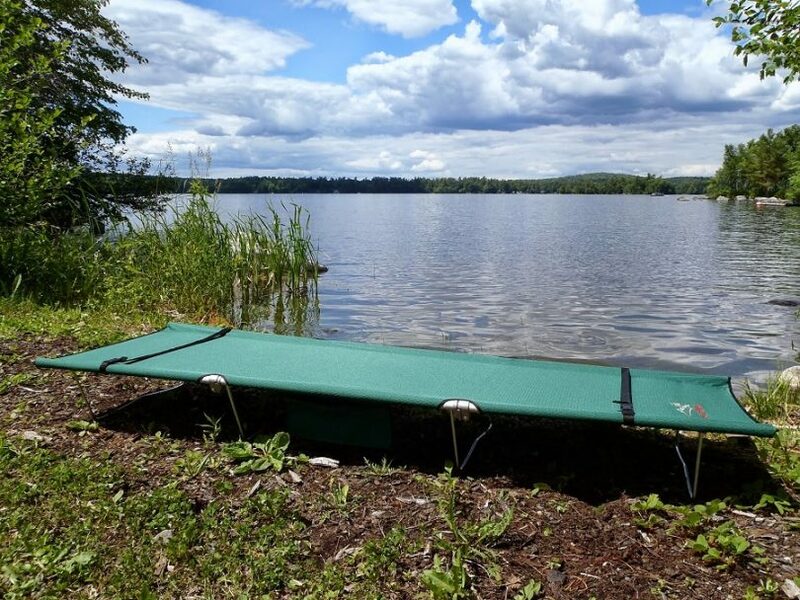 Measuring 70.9 by 27.2 by 14.6 and weighing 16.6 pounds, Forfar Camping Bed is the finest choice for any outdoor activity. It has state-of-the-art, military style design, which is not only comfortable but also durable. Unlike most cradles, this particular piece is designed for the job. This is so since it is made of high quality materials that make it reliable outdoor equipment. 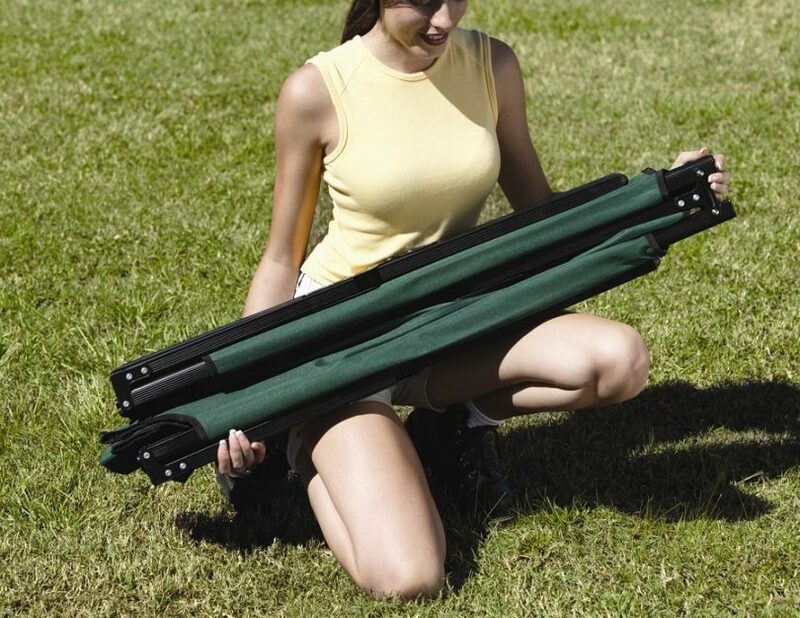 It is ready for set up right from the bag and it also collapses easily, making set up and storage unbelievably easy. It is very comfortable to lie on while relaxing, strong and holds both heavy and light people as long as you do not exceed its holding capacity of two hundred and sixty pounds. Pros: Its military style design, high quality materials and holding capacity make this the perfect folding bed for sleep outs. Cons: It is not a very convenient bed for taller people. Measuring 77x26x1 inches and weighing 3.1 pounds, Therm-a-Rest is one of the most lightweight and portable folding bed for campers. Of all the divans you can find in the market, this particular model packs the smallest. 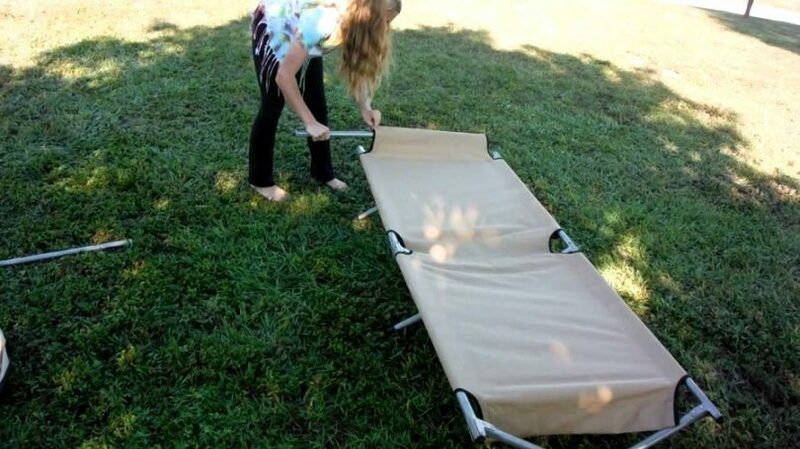 Its lightweight nature makes it the most convenient folding bed for disaster preparedness. 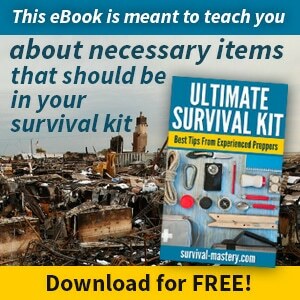 This simply means that it can easily fit in your survival without any problems. It offers you superior, luxurious, off the ground comfort thanks to its original BowFrame structure. 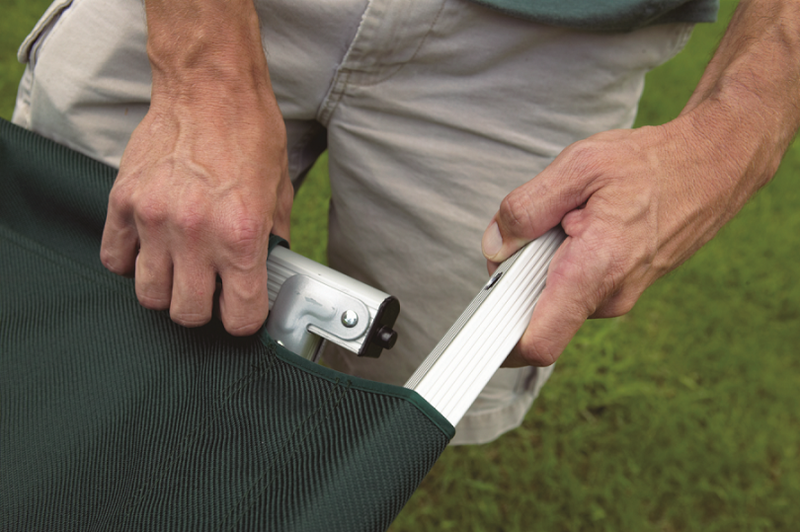 Moreover, the original BowFrame structure ensures that you do not experience high-pitched joints. Its compact design packs easily in a backpack, making it easier for you to carry along. It is fully equipped with lightweight nylon feet, anodized aluminum poles and stretch-free nylon cover to withstand anything. Surprisingly, this masterpiece can hold up to three hundred and twenty five pounds. 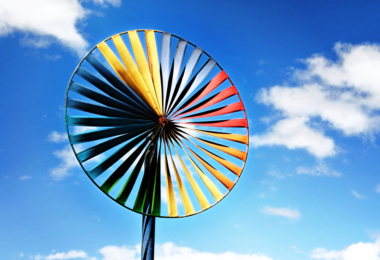 Generally, its design is user-friendly, since it will only take you a few minutes to set up. Pros: It is ultra-light, waterproof and has a relatively large holding capacity. Cons: It may not be a very convenient choice for a taller person. If this is the ideal model for you, then find and buy on Amazon. Your choice of a camp bed needs to be strategic. The most important considerations to make include: weight, size, portability, ease of assembly and holding capacity. As mentioned earlier, a lighter cot is easier to carry around, but a heavy one is challenging. A bed that you can easily assemble without any problems is the one that you should engage. For some wise packing on the go, see our article on the basics of camping essentials you need to bring. The materials used in the making of the fabric and the frame have to be of high quality. This is so since the stability as well as durability of the bed depends on the materials used. Hoping that our advice helped and that the above reviews will lead you to your best choice, we’re waiting for your opinion in comments. Which of these models have you tested? For more tips an hacks on how to sleep better, see our article on this topic .